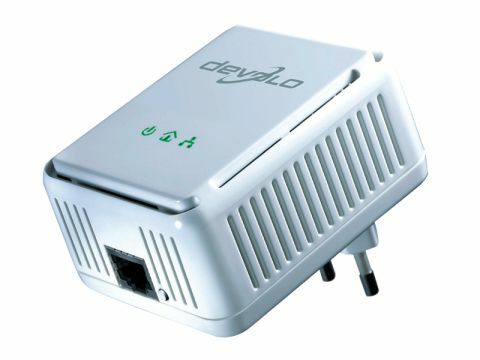 The new Devolo 200AV Easy Starter Kit consists of two dLan 200AV Easy adapters. At present we only have a guide price of £130 (inc. VAT) which may well have dropped by the time you read this review. It got off to a good start as the two Ethernet cables in the package measure some two metres in length which is considerably better than the other manufacturers. Then there's the look and feel, which is smart and shiny with a retro look that is straight out of Poirot. Plug the adapters in and hook up the Ethernet cables and you're rewarded with a network connection within seconds. There are three green illuminated symbols on the front of the unit to indicate power, power line and network connections are present and correct. Software is an extra instead of a necessity and consists of three utilities. The dLAN configuration wizard allows you to assign a password based on the security ID which is printed on a sticker on the base of each unit. The second piece of software is Devolo Informer that advises you of the MAC addresses and firmware versions of the adapters on the network. The software is concise and spells out which adapter is local and which is connected via the power supply grid. The third utility is Devolo Easyshare, which assists in sharing folders and files across your network. The CD-ROM also offers a firmware update to version 2.0, which is the same version on the review units but it could be handy if you end up adding more adapters to an existing network. We were hugely impressed by the Devolo kit and would choose it over the other contenders if money were no object, but of course that's not the case. As things stand, the Devolo 200AV Easy Starter Kit is excellent but needs to drop below £100 to be a winner.